Whether you need us to design your perfect landscape or put your own architect's plans into action, we have everything you need to get the job done. 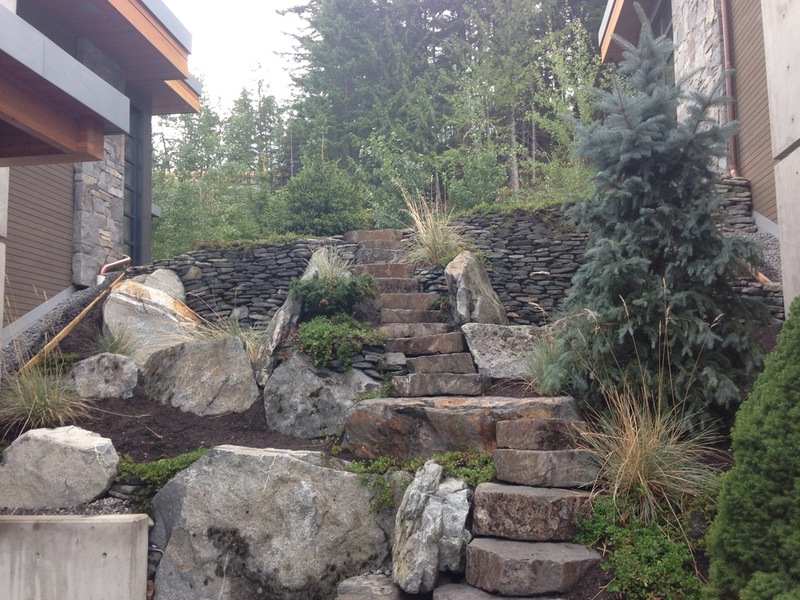 Our experienced construction crews have worked extensively in the local area developing techniques and designs which work perfectly in Whistlers harsh seasonal environment. From full landscape and driveway installations to renovations, improvements, and extreme projects such as building the Tough Mudder course we have the experience and the equipment to complete the job you our clients high standards. Whilst owning and operating our heavy machinery enables us to leave equipment on site, allowing us to use it whenever it's needed saving time and man power in the process. Brick pavers provide a solid driveway surface that can be shaped to shed running water off your parking space. They are also high durable and can endure the punishment that a winter of snow plows, salt and gravel in Whistler can provide. Brick work is highly versatile and can be used for many different applications too, it works as a perfect conductor for heat tracing and can be used for small walkways and paths. Locally sourced basalt and granite is quick and easy way of making a walk way through your property. Dry stack walls also provide a more natural look for controling heights and grade around your property. At Another View Landscaping we have a fleet of our own machinery and equipment in order to provide a large range of landscaping services. This equipment enables us to leave machinery on site for the duration of the build. The assistance they provide with heavy lifting and moving of materials allows our staff to work much more efficiently saving you time and money. Another View owns and operates 4 Skid Steer Loaders. Massively versatile, Skid Steers are able to transport a large amount of material very quickly around the site, cutting out lots of labour intensive tasks. They're are capable of zero-radius "pirouette" turing which makes them extremely maneuverable and valuable for applications that require a compact, agile loader. Another View operates two John Deere mini excavators (17D, 35D). Mini excavators are your smart choice general excavations and site preparation projects. These versatile machines enable us to carefully dig and place materials in even the tightest spaces.